eat run sail: Gosling Sighting! The day dawned gray and gloomy and the forecast of a sunny and blue afternoon seemed unbelievable. We had breakfast and then set out on the 2-mile walk to town with a list of errands to take care of. I love these jaunts to the village... we normally make stops to pick up a few groceries, clear our mailbox at the post office, and find a treat at the bakery. Today we window shopped a bit along the way and all in all we were gone about an hour and a half. I made sure to do some hip stretches when we got back, aong with hamstring and calf stretches too. The trainer on my CRUNCH Bootcamp Workout DVD, during the cool-down stretches on the floor says 'Nothing better than a booty stretch'. Yep, totally agree. We had a nice lunch and then did some chores. Just before dinner time, the sun popped out and the clouds opened up, and the sky was as blue as you could want it... I grabbed the camera and The Captain and we headed out for a walk. A few blocks from the marina, on the same large bay we are on, there is a bird conservation area and a small island that is accessible via a short bridge. I was hoping that we might see the usual pairs of Canada geese with their latest broods. And I was not disappointed! We found two pairs of adult geese, with too many goslings to accurately count - probably 25 or even 30. They are so adorable at this time of year, with their fuzzy little yellow coats... waddling along, oblivious to everything but their hunger and each other. But not the adults. They are such good parents, ever-watchful and they guard the babes very carefully. 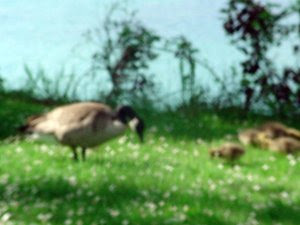 I did manage a couple of pictures, and not very good ones at that, but I don't like to linger too long lest the adult geese think we are threatening the babes and we never get too close either. Next time I will give the camera to The Captain. He has a steadier hand. I was so happy to see them though... and it willl be fun to watch them grow over the next several weeks. Tomorrow we run, and I am looking forward to it. What is That Old Saying? I Had the Best Day! How Many Ways Can You Say 'Rain' ? Adios Cinquo de Mayo... I am moving on.